I first discovered Fàtima Boix in 2017 when looking for E-flat clarinet repertoire on various social media platforms. Having heard the original William Neil concerto as recorded by John Bruce Yeh and Chicago Pro Musica in the late 1980s, I was excited to see that someone had commissioned an adaptation for chamber orchestra. Fàtima’s video clip from her performance at the Music Academy of the West was fantastic. Through further correspondence, I’ve learned that she is a great advocate for the E-flat clarinet in solo and chamber music settings, as well as a great symphony musician. Check out her interview below to learn about her background as an E-flat clarinetist, and how she continues to add to the E-flat clarinet repertoire! JF: What was your first experience with the E-flat clarinet? Did you want to play it, or was it assigned to you? FB: I had some experience with this instrument before, but if I remember right, I started playing it more often around the year 2007 with my clarinet quartet at the conservatory in Spain. We decided to perform Histoire du Tango by Piazzolla at a competition and I chose the E-flat clarinet part. JF: Did you receive instruction on auxiliary clarinets? If so, what was most helpful? If not, what did you discover in your own practice that might help others? FB: The first time I had piccolo clarinet lessons was around 2010, since I studied one year with Marja Kopakkala (the former E-flat clarinetist at the Finnish Radio Symphony Orchestra) at the Sibelius Academy. I always felt quite comfortable with the instrument, but I must admit that in the beginning it was very challenging (well, it still is!). It got better through the years; for me it has been a matter of time to get used to the characteristics of the instrument. I learnt a lot simply by playing it, not only orchestra literature but anything else, from clarinet pieces to etudes. This instrument has always forced me to deal with issues such intonation, sound or support in a different way than on the Bb or A clarinet, so it requires a lot of deep listening, physical education, flexibility and patience…basically like any other instrument! JF: When did you start commissioning works? How many pieces for E-flat have you commissioned and/or premiered? FB: The first one was “Dreaming of a spaceless time…” by my friend J. L. Gómez Aleixandre, that I premiered at my Master’s Final Exam in 2016. In 2017, I premiered the Concerto for Piccolo Clarinet and orchestra by William Neil. On March 6th of this year, I premiered “Shrieking Nature”, a piece for E-flat Clarinet, electronics and video, written by Riikka Talvitie. At the moment I am planning few more commissions thanks to support of the Finnish Cultural Foundation. JF: How did the William Neil concerto adaptation come about? How did you come across the original piece, and what led to the string arrangement? FB: It all started when I found the recording of the chamber version on Youtube. I immediately fell in love with the piece and made a request to the Sibelius Academy Library to purchase the score. I had the feeling that I would play it soon. I got in touch with Mr. Neil via email and, since I got accepted at the Music Academy of the West in California that summer, I decided to enter its Concerto Competition with this piece. Unfortunately, the Academy only accepted Concertos with full orchestra, so it was then when Mr. Neil suggested to create the orchestral arrangement for this occasion. It happened so, that I won the competition, so that allowed me to premiere it at the Granada Theatre in Santa Barbara. JF: What’s one of your favorite pieces to play on E-flat? What’s one of the most challenging pieces for you on E-flat? FB: Basically, all the orchestra pieces that have an E-flat part or solo! It is always a pleasure for me to play this instrument, especially inside the orchestra. 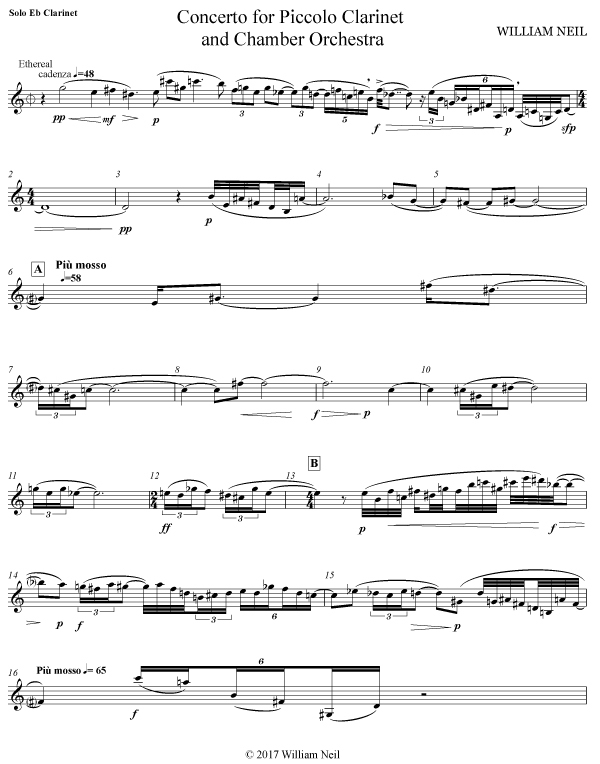 I find specially challenging to play Mahler symphonies, like the 1st or 7th, where the E-flat clarinet has to wait for long parts of the piece and suddenly play something very delicate in high register, for example. In fact, I find every piece on the E-flat challenging, but I enjoy it so much that somehow it doesn’t feel so hard! JF: What advice do you have for clarinetists wanting to commission and perform new works? FB: My advice would be, first of all, finding what moves you to commission a piece for a certain instrument and what do you want to “say”. Be creative and trust your musical ideas. Commissioning is about inspiring someone to create something that is not “existing” yet (so many possibilities! ), so it requires some sort of vision and determination in what you do… I also recommend working together with composers, for me it has been very interesting and rewarding. Born in Alicante (Spain), she has studied mainly in Spain and Finland, where she graduated from the Sibelius Academy of Helsinki, under the guidance of Harri Mäki, Olli Leppäniemi and Christoffer Sundqvist. Fàtima has performed in halls like the Lincoln Center (New York), the Berliner Philharmonie and Suntory Hall (Tokyo) and has played in various festivals as Luosto Classic, Crusell Week, Helsinki Festival, Ny Musik Teater, artArctica (Finland), Aurora Chamber Music (Sweden), Usedomer Music Festival (Germany), Pacific Music Festival (Japan) and Music Academy of the West (USA). She has premiered pieces by composers like Lauri Supponen, Sebastian Hilli, Sergio Castrillón, José Luis Gómez Aleixandre and William Neil and has recorded for the Finnish National Radio YLE. She is a versatile musician interested in a variety of styles, from classical to contemporary music, but also free improvisation, electroacoustic music and interdisciplinary arts. She has played with a wide number of ensembles, including the Oulu Symphony Orchestra, the Tapiola Sinfonietta, the Helsinki Philharmonic Orchestra, the Danish National Symphony Orchestra, the Finnish National Opera Orchestra and the Lahti Symphony Orchestra. In July 2017, she premiered the Concerto for Piccolo Clarinet and Orchestra by William Neil in Santa Barbara (California), after winning the Music Academy of the West Concerto Competition. Currently, Fàtima holds the Second and E-flat Clarinet position at the Finnish Radio Symphony Orchestra.